What boy doesn’t love dinosaurs and trains? Not many–and certainly not my boys. So John Steven Gurney’s Dinosaur Train became an instant hit in our home. We read, and re-read, and then read with Daddy last night. 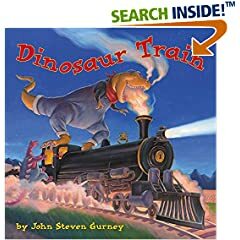 With very few words, the focus of this book is the gorgeous pictures that depict a boy who lives a great fantasy–a train ride with dinosaurs! Be prepared to examine the illustrations–this book is for a picture book lover–which makes it excellent for independent reading as well as enjoying with Mommy and Daddy.